The markets freaked out this week after the Dow Jones Industrial Average dropped 795 points in a single day on Tuesday, and continued to plummet on Thursday. To give you some context, a yield curve is a graph that shows you how much money you’ll get back if you buy into government-backed bonds. Usually, this graph curves up. And that makes sense because you’d expect to accrue more interest on a longer-term bond. But when you have an inverted yield curve, that graph goes in the opposite direction. When this happens, shorter-term loans like the one-year U.S. Treasury bond actually give you a higher interest rate than a 10-year bond. Usually, an inverted yield curve is a warning sign to investors that something is wrong with the economy. People become fearful that economic growth will stall and everyone will start hoarding money. However, something different is going on today. We’re actually in a deflationary boom period driven by rapid technological developments. That means the prices for goods keep going down even as we experience massive economic growth. As I’ll explain in today’s video, this kind of environment can be dangerous for old companies with obsolete technologies. But it can also be an extremely lucrative time for companies whose technologies have changed with the times — and also for the investors who back them. To check out that video, just click on the “play” button below. 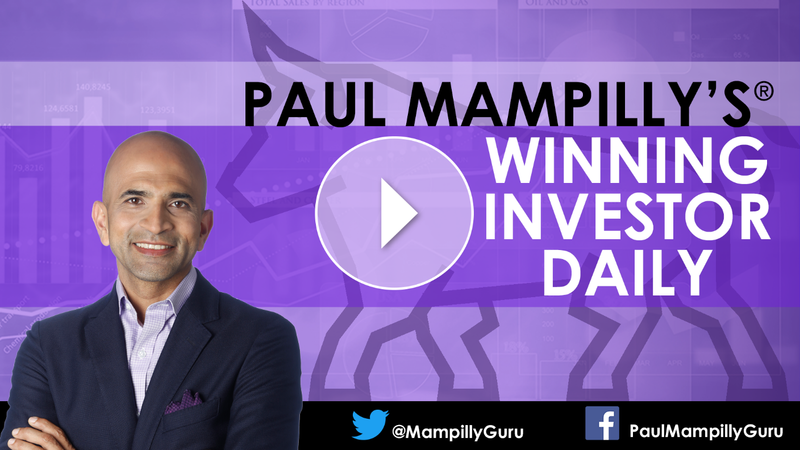 Hey, this is Paul with your Winning Investor Daily. The markets are freaking out! On Tuesday, the Dow Jones Industrial Average dropped — I mean, really, really dropped — by 795 points in one session. Boom! What is this inverted yield curve and why is it something that stock market investors fear? Well, first let’s quickly go into this inverted yield curve. The inverted yield curve is something that refers to interest rates and the bond market. And, in anything that you’re reading, it specifically refers to the market for U.S. government bonds. The United States government is regularly selling bonds, virtually every week. You can look up and see what an investor is getting this week when they buy a 10-year U.S. Treasury bond, as they’re referred to. And, most times the interest rates on the 10-year bond are higher than they are on the one-year bond. That makes sense because, in recent history, we’ve had inflation. In other words, the government is going about creating inflation at a rate of something like 2%. It makes sense that if you’re going about buying a bond where you’re expecting to get your money back in 10 years, to keep up with inflation, you would have to get a rate of at least 2%. And you’d want some sort of reward on top of that. So, it makes sense for that interest rate to be higher than the one-year. This inverted yield curve that you’ll see referred to on all these websites is referring to the fact that if you go and look at it, the one-year bond is actually giving you a higher interest rate than the 10-year bond. That strikes a lot of people as weird. And, if you’re on Wall Street, it also strikes fear into your heart. Why is that? The reason why someone would do this is because they look around at our economy and think that economic growth is going to slow down and people are going to start hoarding money. And [they think] that in some point in time, this interest rate on the 10-year bond will go back to being higher than the one-year bond because into any economic weakness, the Federal Reserve will lower interest rates, and the one-year bond will go down. Eventually, the yield curve, which is currently inverted — meaning that the 10-year bond gives you a lower interest rate than the one-year bond — it goes back to being a regular yield curve, where the one-year bond has a lower interest rate and the 10-year has a higher interest rate. Now, normally I would go with this explanation. And, if I were going with this explanation, I would be telling my subscribers of Profits Unlimited, True Momentum and Extreme Fortunes that they should sell their stocks and prepare for a bear market, where stocks go down and go down a lot. And, [ask] are we priced for much lower levels of economic activity? However, I believe there is something different going on today. It’s a very unusual thing that’s happening, which is that we have so much technological development going on that it’s creating what I believe is a deflationary boom. Now, you will struggle to find a lot on these deflationary booms because we’ve really only experienced one or two of these. And, if you go on Google, you’ll see that we experienced this in the late 1800s, as we also had a convergence of technologies occur at the same time. We had multiple developments in transportation and communication, and all of this also caused a deflationary boom. By that, I mean that prices also went down even as we had economic growth. That’s something that is very different — very unusual and only occurs at a point in time when you have a lot of different technologies coming together at once. These technologies make things better, faster and cheaper. As a result, that moved prices down. And, in that period, you would expect the yield curve to be inverted because you are going to lock in interest rates on the 10-year bond. You know that interest rates on the one-year bond are likely to go down. Not because there’s going to be economic weakness, but because there’s no reason for them to be this high. We are in a period of deflation instead of inflation driven by technological progress. This is a very unusual thing that happens. Because of that, you can expect people to fear a great deal as we go through these periods. And, in all likelihood, they’ll sell stocks down. Then they’ll come back to buy them again as it becomes clearer that we’re going through a period where prices will go down because our technology is making them cheaper. This is called a deflationary boom because as prices go down, even if income goes up just a little bit, you can start to afford more things. Now, the danger in an inflationary boom is where there are old companies with old, obsolete technology, services and products that have a lot of debt and can longer pay it. Those companies are in big trouble, and they are eventually going to go bankrupt, for sure. First, you’ll see it happen slowly, and then it’ll happen all at once. I believe in this current cycle we are likely to see this happen slowly over time. And, you’re beginning to see some examples of it. For example, a company like Sears that’s been around for a very long time — that in its time was a pioneer — is now going bankrupt. If you read the news on a regular basis, you can see that in the places where technology has been moving for 10 to 15 years, there are big winners like Amazon and big losers like Sears. And, you’re likely to see more of that. I believe that is a much bigger risk to you as an investor than the inverted yield curve because of what I told you about. So, that’s my Winning Investor Daily for this week, which is that, in essence the inverted yield curve represents a sign of the time. A sign of the period that we’re in where we have these incredible technological developments that are making so many of our products and services better and cheaper. That’s going to be reflected in lower prices. And, while there’s great concern in the market today, I believe that the stocks to own are the stocks that are creating the deflationary boom — the growth stocks of today and the technology stocks of today. And the thing to really worry about is the old companies that reflect old ways of thinking, old technology, old products and old services that are being wiped out by the new. So, that’s my Winning Investor Daily. If you like this video, please give it a thumbs up, subscribe to this channel and share this with your friends and family. I’ll have another one for you next week. Until then, this is Paul saying bye! Instead of being fearful, you should look at the inverted yield curve as a sign of the time we live in. It’s a sign that incredible technological developments are making our products and services better and cheaper. And as investors, that means the stocks you want to own are the ones creating this deflationary boom. I talk about many of these high-growth technology stocks in my Profits Unlimited service, and already have several new opportunities on my radar for 2019. So, if you too would like to invest in the world of the future and get ahead of the Wall Street crowd, make sure to check out my flagship newsletter.